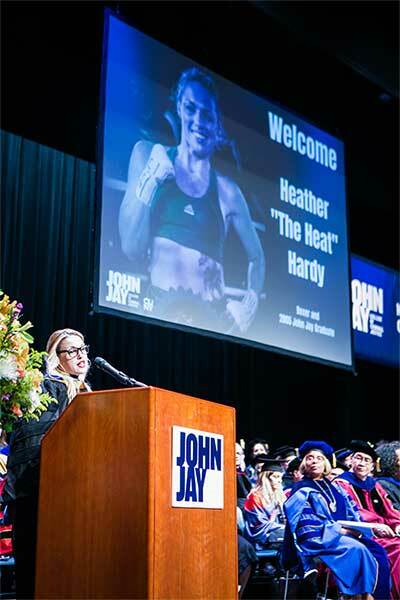 At this year’s New Student Convocation, alumna Heather Hardy ’05 wowed the crowd with a rousing keynote address. New students and transfer students walked out of the event fired up to fulfill their dreams. We decided that everyone in the John Jay community could be inspired by her story, and we wanted to learn more about Hardy’s long journey to becoming the WBO World Featherweight champion after beating Shelly Vincent October 27, in a televised match on HBO. What was your proudest moment from being a student at John Jay? When I was a student at John Jay, I worked 9:00 A.M. to 5:00 P.M. Then I traveled from downtown to take night classes. I think my proudest moment was when I made it to graduation. It wasn’t something anyone in my family had ever done, and at the time, very few people in my neighborhood had graduated from college. It was so satisfying taking that walk at Madison Square Garden and holding up my diploma. What was a typical day like for you back when you were a student? What advice would you give a current John Jay student facing similar circumstances? Click here to hear Hardy’s entire speech from New Student Convocation. Your ascent in the boxing world has been amazing. Can you tell our students about a moment when you doubted yourself, and a moment when you knew you had made it? My rise in women’s boxing has been unprecedented. My coach believed in me long before I started to believe in myself. The best advice I can give anyone is to trust and have faith in the whole journey. There were times it felt like I had to take two steps back to take one step forward, but success lies in focusing on the forward motion. There were so many times I was ready to throw in the towel— boxing repeatedly turned its back on me in my career. For my 20th pro fight I was defending my WBC title at the Barclays Center. I sold $40k in tickets myself, I had news crews and sponsors present, and not only was my fight not being televised, they put me on first, before they even opened the doors for the fans to come in and cheer me on. I made my walk to the ring with no one clapping for me. The seats were all empty. I could’ve given up, but I decided to take another route and spent one year in professional MMA with Bellator. I used the exposure they were giving me to talk about the sad state of women’s boxing, and now, two years after that walk I took to the ring in an empty stadium, I boxed for my first world title, at Madison Square Garden, on HBO, and became the WBO World Featherweight Champion. Never give up on your dreams, because they might come true. What's the hardest part of boxing? How do you deal with it? The hardest part of my job is making weight. Boxing is a weight-based sport, and I have to be in tip-top fighting shape to compete 10 full rounds. The month leading up to my fight is a strict diet, and the week before is basically just juice, water, and workouts three times a day. I love to eat so this is torture. Without John Jay, I wouldn’t be where I am today. What separates me from my competitors is my intelligence. John Jay prepared me with the life skills I needed to run a business, maintain professional relationships, understand competitor strategies, and be aware of the way the world operates around me. I have my degree in forensic psychology, perhaps the furthest thing from boxing, but I never would’ve been able to rise above the rest without having that upper hand. Can you tell us something surprising about yourself? One thing about me people that surprises people is that I didn’t start boxing until I was 28, long after graduating from John Jay. I wasn’t in college with the goal of becoming a professional athlete. My goal in college was to learn as much as I could and get my degree. My advice to students who are in school now, not knowing what they want to do with their lives, is to take all your required classes. Any degree is better than no degree. You have plenty of time to figure the rest out.